Complete Buying Guide | Pleated Shades | BlindsOnLine.com - BlindsOnLine.com Inc.
Pleats have been used commonly throughout history for upholstery and clothing. To this day, people still choose to install pleated blinds on their windows because of the effective, time-less, and simple technology. To imagine exactly how a pleated shade works, picture an accordion opening and closing; when it’s closed its rather compact, but when it’s open it has the potential to stretch out quite a bit. At BlindsOnLine.com, we have recently added 1 new pleated shade product to our inventory: The Grass Cloth Pleated Shade. To see the true benefits of pleated blinds, we must compare them to cellular blinds. The typical homeowner would probably not be able to tell the difference between a pleated shade and a cellular shade, especially if just looking through images on the internet. But while it is true that these 2 window treatments appear very similar at first glance, cellular shades are actually built with honeycomb-like, insulating cells, which is why they are often referred to as honeycomb shades. 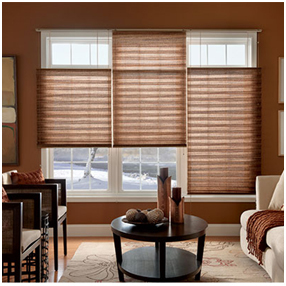 Because pleated blinds are made from less material than honeycomb blinds, they are much less expensive. Customers who are on a tight budget can save even more money on their window treatments by purchasing their materials online. The pleated shade is perfect for individuals who spend a good amount of time staring out their windows because it is designed to compress tightly when raised. Although installing pleated blinds isn’t an incredibly difficult job, it is still important to always follow the instructions. DIYers should also remember to research exactly how to install their particular window treatment because they may have a different set of instructions than other typical window treatments. Those who require assistance when installing this product should contact a family friend or a professional to help them. When comparing the Economy Pleated Shade to the Grass Cloth Pleated Shade, the first thing that customers will notice is the price. Aptly named, the ‘economical’ Economy Pleated Shades is created for the type of person that doesn’t care about extravagance; although it is attractive, there is nothing eye-catching about this product. The Grass Cloth Pleated Shade, on the other hand, is slightly more expensive because it is made from 100% man-made fibres and offers a more interesting appeal to rooms by bringing the beauty of nature indoors. Now that shoppers have the internet, they are not only able to receive their online purchases with ease, but they can also research their products beforehand and determine just exactly what they will need. Armed with the above knowledge in this pleated shades buying guide, you should feel confident enough to make an educated decision regarding whether these gliding doors are the right window treatment for your project. 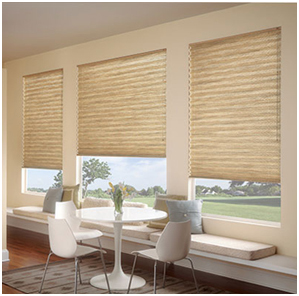 Shop for panel track blinds online today and browse our entire BlindsOnLine.com inventory by visiting our website today.